Today we’re launching a Patreon page! Patreon is a platform that allows fans to support creators and creative projects on a regular basis while also getting some perks at different tiers. In many ways it functions like a membership program. 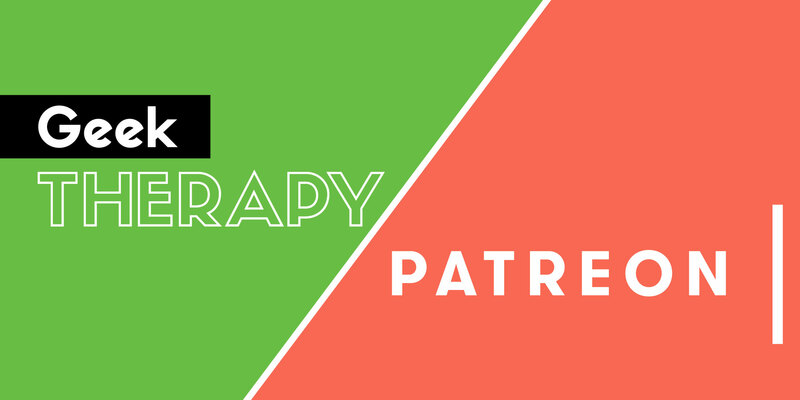 This is just another way to help Geek Therapy grow and reach more people. Your support means the world to us. Believer ($1+) – Patreon-exclusive posts and community features and your questions have priority on our podcasts. Viewer ($2+) – Exclusive video content. Listener ($3+) – Exclusive audio content. Messenger ($5+) – Access to giveaways. Superhero ($10+) – ‘Office Hours’ where we meet and answer your questions. Our stretch goals include exclusive audio posts for all patrons and a monthly book club. Check out our Patreon page for more information and consider following us on Patreon for future updates if you choose not to become a patron now.